As you guys know, one of our weeknight staples is pizza. I'd say we eat pizza at least twice or three times a week. So, I guess you could say somewhere in those 130 or so pies we make at home each year, we've picked up a few tricks. Here are the top 5 for busy weeknights. We usually make our pumpkin garlic knots crust or substitute all water for the pumpkin puree, depending on what we have in the pantry. 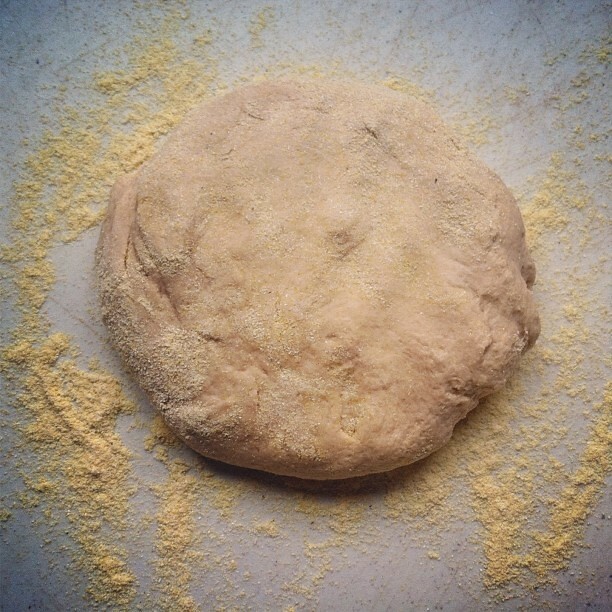 But a trick we picked up over the years is to always roll out our dough with cornmeal. Not only does it help with transferring the dough to the pizza stone (another necessity! ), but it always give the crust a nice crunch. 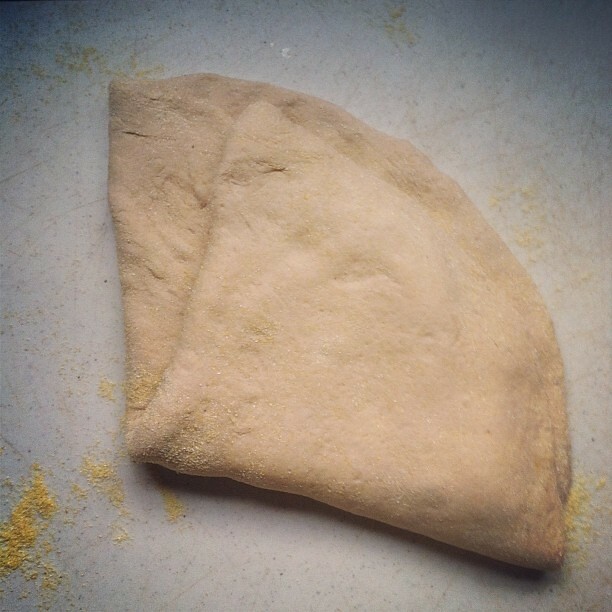 From there, transferring the dough to the pizza stone is made easy -- even without a pizza peel -- by gently folding the rolled out dough in half and then in half again. We simply place the quarter down on the stone and then unfold and reposition quickly. Since it's not tomato season, I usually cook up some type of homemade sauce using canned tomatoes. On busy weeknights when I just don't have the time, I improvise. 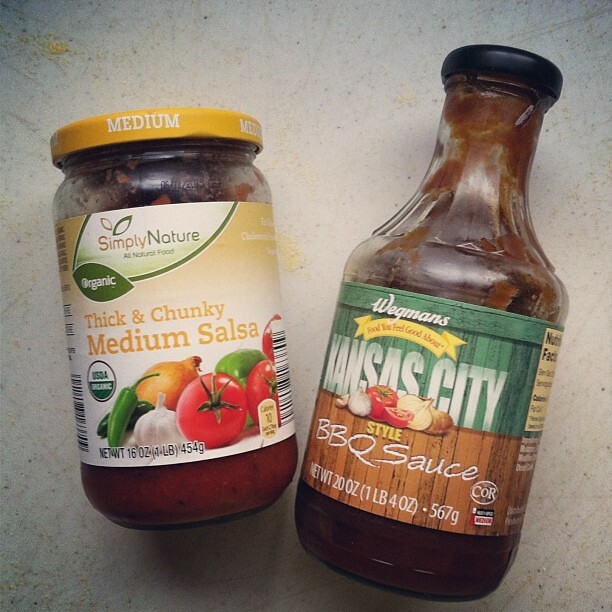 My favorite makeshift sauce these days? A mix of half salsa and half barbecue sauce. Certainly has a nice zing to it! 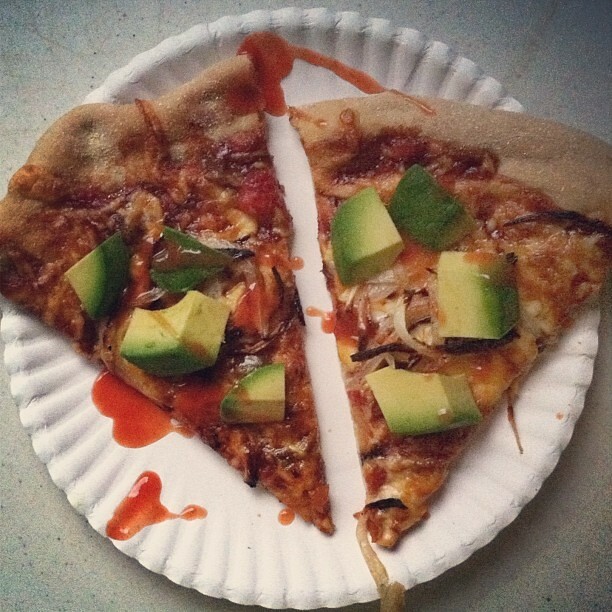 Along with a generous heap of roasted veggies, we like topping all our homemade pizzas with cold avocado slices. 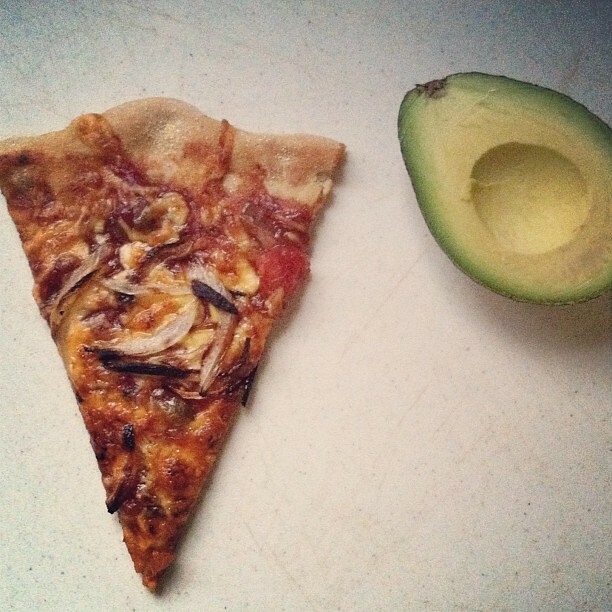 Not only do the vegetables and avocado add lots of good-for-you nutrients, but they also help us justify eating pizza more often. This particular example isn't teeming with as many toppings as we usually enjoy, so if you'd like to see a better example of a loaded pizza, check out this lightened up recipe. And with all those toppings, you need more sauce. We always have a bottle of hot sauce nearby, whether it's standard Frank's Red Hot (have you guys tried our Vegan Tofu Wings?) or spicy Sriracha. I also like ranch dressing or even a quick side of this 5-minute tomato sauce.